First Ask a Storytime Ninja Question! Thank you, Liz Anderson (@lizpatanders) for asking the first question. Such a good one! The Storytime Ninjas rose to the challenge. Answers will be posted as they are received so keep checking back! If you’d like to be a Ninja find more information and sign up here. 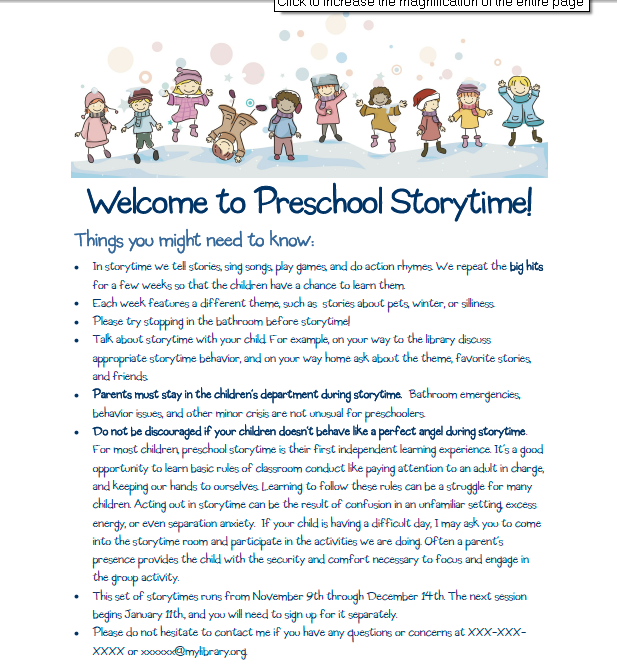 When you do preschool storytime, I wanted to ask how you go over rules with your kiddos. Do you have a puppet that tells the rules? Do you just tell the kids? My preschoolers are pretty well behaved, but keeping hands to ourselves is sometimes an issue, as well as having side conversations. The only other issue is kids who will lean their chairs backwards, which is an issue because then they fall and hurt themselves. I don’t want to be too harsh, but I wonder if there’s a better way to gently remind the kids of how we behave other than just saying “How do we behave during storytime? We keep our hands to ourselves and take turns talking.” I know some folks use puppets and while I enjoy hosting puppeteers, it’s not an area I feel comfortable exploring myself. Part of this has to do with the fact that my predecessor used a monkey puppet in lots of her programs–while the kids enjoyed it, she left a huge legacy that’s been hard to fill, and there’s been some sadness over the fact that I am not her. I want to do things in a ways that are different from what she did to show that while I’m doing the same job she did, I sometimes like to do things differently. For saying the rules, I would recommend doing what you’re comfortable with. If you feel awkward using a puppet then kids will notice. I personally don’t ever use puppets. My predecessor did, but it’s not something I’m good at or enjoy- so i just don’t bother. Use your strengths! Soon the parents and children will forget about your predecessor’s style because they’ll love your storytimes. Since you’re dealing with preschoolers I would address them directly. Make it positive, but also get your point across. Something such as, “My name is Miss Liz and this is preschool storytime! I’m so excited to see you guys and we’re going to have a wonderful time. To have as much fun as possible today I need everyone to sit criss-cross applesauce and keep our hands in our laps.” Change the wording to fit your message and say it at the beginning of every storytime. As for the chair situation, I would just make them all sit on the floor. I had issues with this too because chairs had always been used before I came. I think children are more engaged on the floor when they don’t have one more thing competing for their attention. I also have my parents sit on the floor. I’ve found that they are less likely to talk to other parents if they have to sit on the floor next to their kid. I keep a chair or two in the very back for the elderly and pregnant moms, but once you set the standard that everyone sits on the floor people will stop asking what happened to the chairs. Good luck! Wow, there are a lot of things going on in this question. I see two issues: getting kids to follow storytime rules, and dealing with filling the shoes of a long term, beloved librarian. First, I’m wondering why your kids are in chairs at all during storytime. A lot of storytime issues can be cleared up by what is considered “classroom” management. If your environment is set up to minimize chances for distraction and acting out, behavior will naturally be less disruptive. Getting rid of chairs will mean the kids have one less prop that they can mess around with during storytime. Once the room and the kids are arranged in such a way that temptation is lessened, take a look at how your storytime is structured. Make sure there is the absolute minimum of downtime. Don’t give the kids a chance to get bored. And don’t really give them a chance to talk, either. That sounds awful, doesn’t it? Let me explain– while you want children to participate in storytime, through action or call and response, you don’t really want to open up the opportunity for rambling preschool monologues. This will stop your storytime dead in its tracks and all the other kids will start acting out because they don’t care about Johnny’s epic story about whatever. If a kid starts in, say gently, “Let’s talk about that after storytime, okay, Susie?” and then plow right on with what you were doing. Also, if you’re not comfortable using puppets, that’s going to come through. So chuck that puppet, until the time comes when you’re really excited to use a puppet in an awesome way, rather than using it as a “bad cop” to your good cop. Make sure you are as passionate as possible about every storytime you present. If you are excited, energized, and having fun, the kids will follow you. Keep a beloved ritual or two if you must, but other than that, do storytime your way. Eventually the kids will come to love you just as much if not more than they loved the previous librarian. Other kids might never come around, but eventually they will age out and you won’t have to worry about it. In a couple of years, the kids you have will hold you first in their heart. So just be patient. If, after these changes, you still have issues with a child or children, eventually you are going to have to talk to a parent and let him or her know that little Timmy is disrupting the program for others, and they need to help you make it better. For my preschool storytimes, I generally try to 1) use subtle means (diverting attention elsewhere, good stretchy rhymes, etc.) to lead children “naturally” into good behaviors and when that fails 2) be firm but kind about the storytime rules. I almost never use puppets. I make sure to choose a variety of books to have on hand, depending on the mood of the crowd that day. I am flexible so that if I notice a lot of them getting wiggly, I can adapt and add in extra stretches, songs, movement activities, etc. Usually that works. Kids are eager to please and often they do need a few gentle reminders. Liz, I don’t specifically go over storytime rules with the kids. I like to say my storytimes come with a side of chaos so a certain amount kids-messing-around does happen. Usually a frown and headshake in the offenders direction will get them to stop, and if it is really disruptive I will try a “it’s time to be quiet now” or “stop trying to strangle your friend.” I use carpet squares so luckily don’t have chair tipping issues. I’ve also found fingerplays/rhymes to be a great way to bring attention back to me and get kids involved again. Open, Shut Them and any rhyme that involves a surprise clap, like Ten Little Sausages, work well for me. Hope this helps! 1. You are not your predecessor. It is sometimes better to do your own thing, rather than be compared to her. If you don’t do puppets well, which it sounds like something that she did, highlight your strong points. Do you sing, do fingerplays, play with scarves, etc.? At our library, both of us who do story times have different styles and this works because we each handle different ages. The kids are always sad when they bump up a level and miss out on something fun, such as bubbles, but then they find the cool stuff that they now get to do, such as dancing. 2. How are you comfortable explaining the rules? We use pictures for some of our groups made with Boardmaker. Concentrate on the top things that you want to convey as these are kids and this is work for them. I try to highlight 3 things (but no more than 5 or 6) for them to practice, depending on the group. Examples include listening with our ears, hands to ourselves, and sitting on the floor. Plus, there are tools that you can use as the leader without them being rules. An example of this is saying “We’re all going to sit down now on the floor” while using your hands to gesture down and they can follow your example. Personally, I would get rid of the chairs too for the story portion of the program or put them along the outside of the room for parents/caregivers. Whenever possible, I ask a co-worker to join us in for storytime. When things are running smoothly, she models storytime behavior, and participates in activities. But when things get out of hand, she can help put out fires: she can be a parent-fetcher when a child needs to leave the storytime room and/or when a child’s behavior is becoming disruptive. This year, we are very lucky to have an awesome intern, Ms Holly. One of her priorities is to learn the ropes of running a storytime. She has been a huge help, and has been a great “2nd adult” in the room. When she isn’t available the lovely Ms. Shelley has filled in. Finally, I wanted to communicate to parents that preschool storytime is a major transition for their children. This means that even if their child is excited about the prospect of preschool storytime, the adjustment can be difficult. In preparation for the new session, I rewrote the handout I give to parents on the first day. My goal is let them know that I don’t expect perfection. I also want to communicate that, even though they aren’t required to be in the room, they’re not dropping their child off at daycare. I wanted to address the issues that are particular to library storytimes for this age group. Link to her full post on this topic here. Preschool is a wonderful time. The children are so smart, imaginative, and ready for fun. Again there’s no way sure-fire way to make sure every storytime run smoothly. Chaos is a given. It keeps me on my toes. Everyday is a new opportunity to share my love of reading, singing, and silly dancing with a group of delight little rascals.